Just good ol' common folk... Hard working Democrats and German Baptist people from up on Bull Run. Cornelius Shehane (Shahan) Coming to America! Born: about 1660-1670 in Ireland, County Down. Passed: about January 15th, 1739 in what is now known as the state of Maryland. Wives: (1) Alice Died: 1729, (2) Ann, (3) Mary Storey Married: Aug. 6th, 1723. John Huffman  was born October 23rd, 1741 in Berks Co. Pennsylvania and passed around 1790. He bride's name was Margarette. Last name, "unknown". John served in the American Revolutinary War. David Shahan  Born: August 11th, 1716 Passed: December 19th,1794 in the Colony of Delaware. (He out lived his son, also named David. See below under Generation 2. Age at time of passing: 78. He married Rose Parvis on January 1st, 1738. (2) Susannah Seward on Married: March 10th, 1776. Susannah: Passed in 1795. * Sidney Shahan Born: between 1740-1755 She married James Wallace. * Mary S. Shahan-Hosaple B: 1851 P: 1930 B: Heneryetta, OK.
Every story, every legend contains some truth they say.... I always heard growing up that three brothers came to the United States from the old country, Ireland. Two settled in the east and one went out west to seek his fortune. This is partly true. Three brothers came from Ireland. Two, together and one alone. All three settled in the east. It wasn't until the fourth generation that a Shahan set forth for the open spaces to the west. John and Sarah were very hard working industrious people. Sarah carded her own wool. They say that Sarah was a small wiry woman. A coverlet that Sarah is on display at the Smithsonian Institution. John and Sarah lived in Masontown, Pa. till around 1797 when they moved to Smithtown, WV. Monongalia County, just south of Morgantown. They were among the first member of the Goshen Baptist Church, which was organized on August 2nd, 1837. * Elizabeth Hoffman Born April 06th, 1808 Passed "unknown"
* Squire Hoffman Born "unknown" Passed 1850 in Port Hudson, LA. Louisiana. 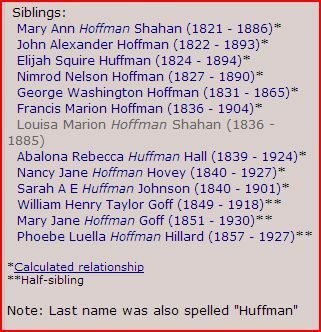 Huffman family history notes: It seems that both names of Hoffman and Huffman were used. Hoffman is the correct German spelling, but some adopted Huffman as the new American version of their name. Odder yet, the parents would use one spelling and their children the other. John Shahan of Preston Co., Virginia 1794"
* John William Shahan B: February 17th, 1828 in Harrison Co.
* Joshua Herman "Herman J." 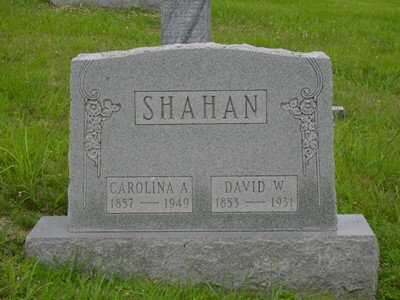 Shahan B: October 3rd, 1866 in Harrison Co.
February 1st, 1818 in Preston Co., WV Married about 1832. 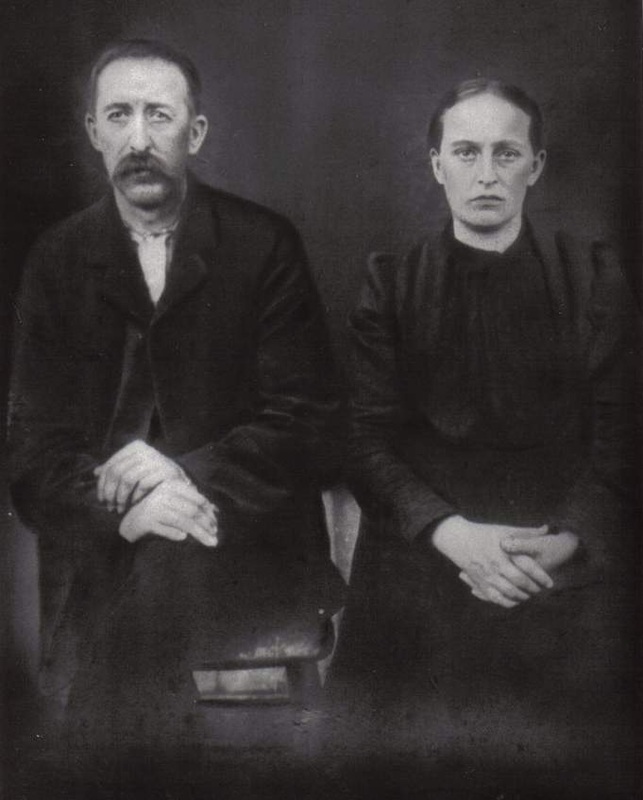 Alberta (Shahan) and husband Ebenezer Wolfe. Christmas Day 1886. George & Isabelle Cemetery on Golf Hill, Preston Co., WV. George Shahan land survey in WV-1836. 105 acres part of land Treasury warrant No. 12732, 24th Nov 1836 entered 10 Mar 1838. * David William Shahan [3D] Born October 30th, 1825 Passed after May of 1910. David married Mary Ann Hoffman (Huffman) on December 25th, 1846 in Preston Co.
* Rebecca E. Shahan Born about 1851 Passed "unknown"
* Lula V. Shahan B: 1875 D: 1976 M: (1) James A. Knotts 11-19-1892 (2) M.
* Mary Ann Davis Born about 1866 Married: Samuel B. Spring on July 3rd, 1888. George Washington Shahan: (Generation 5) Born 02/28/1830 Passed 06/29/1891 (Cancer) Another record shows George passing on June 20th, 1891. 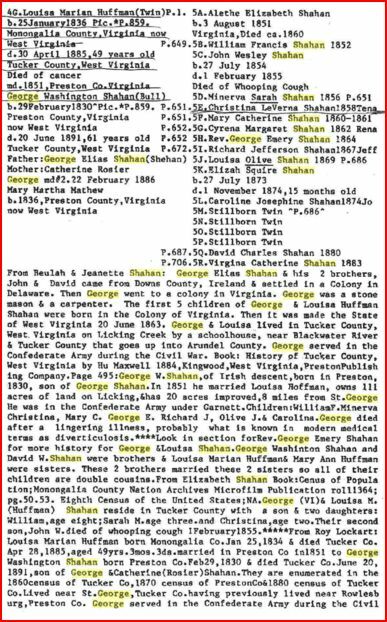 George Washington Shahan and Louisa M. Hoffman (Also spelled Huffman) Married 1851 in Preston County, West Virginia. ( Mrs. Louisa Marion Shahan, aged 49 years, 3 months and 3 days. She was born in Clinton District, Monongalia County; was a consistent member of the M. E. Church for 37 years.) A second marriage to Mary Martha Mathew (Widow / Born 1836) took place in Preston County, on February 22nd, 1886. They had no children. But a 1880 census lists David C. W. as "son" and Louisa as a "granddaughter". George Washington J. Shahan was born; February 28th, 1830 in Preston County, Virginia. Died June 29th, 1891 in Tucker County, West Virginia. Served in the Confederate Army During The Civil War. George served under the command of General Richard Brooke Garnett. Note: One brother fought for the side of the north and one for the side of the south. A story told by Benny Shahan (son of David and Martha Roseanna Shahan) that the Union army came to their farm and planned to take their only cow. George, wanting to protect his family's interest had the soldier on the ground and had the soldier's eye outside of it's socket, when he was convinced by his wife, to let the soldier up, unharmed. It is hard to say what makes on man choose one direction, while his brother a different direction... Nick Named: Bull. Death Records list occupation as a Stone Mason. * Side Note: General Richard Brooke Garnett (November 21, 1817 – July 3, 1863) was a career United States Army officer and a Confederate General in the American Civil War. He was killed during Pickett's Charge at the Battle of Gettysburg. * Alethea Elizabeth Shahan, born August 03, 1851 in Rowlesburg, West Virginia; died around 1860. * William Francis Shahan, born December 22, 1852 in Rowlesburg, West Virginia; died September 1942.
of Samuel Nestor and Permilia Holt. * John Wesley Shahan, born July 27, 1854 in Rowlesburg, West Virginia; died February 01, 1855. * Sarah Minerva "Tina" Shahan, born October 20, 1856 in Rowlesburg, West Virginia; died 1944.
in Tucker County, West Virginia. * Christina LeVerna Shahan, born May 16, 1858 in St. George, West Virginia; died February 02, 1933. * Cyrena Margaret Shahan, born September 08, 1862 in Rowlesburg, VA; died August 15, 1943. * Georgia Oletha Shahan Born: December 14th, 1910 Passed: July 12th, 1975 Georgia married George S.
* Edwin Allan Tutwiler, born November 28, 1948 in Atlantic City, New Jersey. Sipko-Banosky. Arabelle was in charge of White House sercurity during the Jimmy Carter Adminastration. * Ronald Fredrick Barnosky, born November 19, 1944 in Columbus, Ohio. * John Wayne Barnosky, born May 04, 1946 in Columbus, Ohio. * Betty Jean Barnosky, born November 10, 1948 in Columbus, Ohio. * Mary Ann Barnosky, born January 28, 1953 in Fort Belvire, Virginia. Shahan-Shahan on September 30th, 1931 in Newport, KY.
* Elizah Squire Shahan, born July 27, 1873 in Rowlesburg, West Virginia; died November 01, 1874. Note: Donald Mann and Ira Shahan used to hunt together. * Stillborn Twins Shahan, born about 1875 to 1879 Un-named. Church at Bull Run in West Virginia, Daughter of Benjamin Annon and Sarah Fry. Unknown Virginia Catherine Shahan married (1) Harve Dunlap, (2) Sam Austin, and (3) Arthur J. 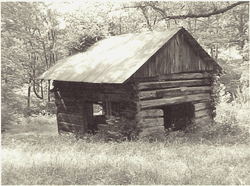 "The family lived near Rowlesburg, West Virginia for many years be-fore moving near St. George in, Tucker County. There the family lived within the boundary of the Union Chapel (Bull Run) branch of the Shiloh Congregation. 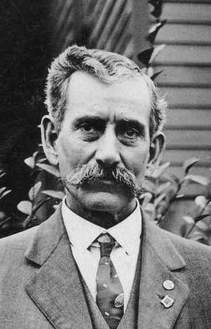 "The eighth child of eighteen children, George Emory Shahan, manifested special talents and an early interest in religion. He began a vigorous study of the Bible while still in his teens, mastering large portions to memory. His obituary states that he began preaching at the early age of fifteen, which would have been around 1879. The year after his marriage, in 1891 to Cora Jane Hovatter, he was ordained to the ministry. He was advanced as an Elder in 1904 and there upon given charge of the Shiloh Congregation, a position he held until 1907." "He continued his labor for the Church at Union Chapel, serving as one of the ministers of that branch until his transfer to the Grafton Brethren Church which later became the Grace Brethren Church." Emery retired in 1940 and moved to Clarksburg. "Most of his life was devoted to free ministry, supporting his family by farming and carpentry. Prior to moving to Tucker County, George Emery Shahan had accumulated a large tract of land, some of which was purchased for as little as $1.65 an acre. Most of the land was sold during the Great Depression, and sadly, little gain was realized." "Rev. Shahan was respected as a man of high moral character and a man of devotion. Emery and Cora Jane Hovatter-Shahan had fourteen children together. He left a strong impact on his family and those with whom his path, touched." "A member of the National Fellowship of Brethren Ministers, Emery was the oldest member of that organization at the time of his death which was age 102 in 1966. He still occasionally preached in the last decade of his life."